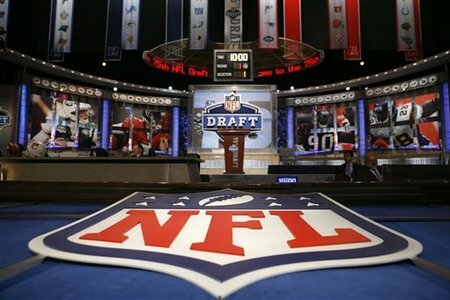 The NFL might be in the middle of a labor dispute but the Draft will go on! In just under a month from now we'll get to see what collegiate talent will be playing for our favorite NFL teams whenever there are professional football games again. This is my latest attempt to figure out how the 2011 NFL Draft will unfold. While I'd bet that there will be more draft day trades than the 0 I've predicted here, it would be really annoying to read this if I'd have included them. So you're welcome for that. You can find this along with other Mock Drafts listed at Walter Football and DC Pro Sports Report. If you are visiting SKOHRboard.com for the first time please "like" our Facebook page so you can get all of our latest posts in your newsfeed along with other relevant and interesting sports stories from across the web. Anyway, check it out and let me know what you think of your teams' selections so I can make this better next time. Oh! I also added a 2nd Round to this mock to give you a little better depth. Please don't hesitate to leave comments, I try to take all thoughtful consideration given into account each subsequent time I put one of these together. 1. 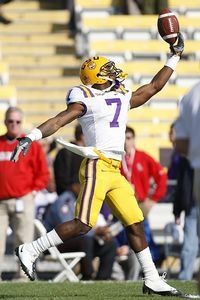 The Carolina Panthers select Patrick Peterson, CB from LSU. Talk about him being a Safety is crazy. He could absolutely play Safety because he is a tremendously gifted athlete, but that's not the point. He can be an elite shutdown CB which is much more valuable to any team than a good Safety. I'm also stupified when people say that he won't be taken #1 overall because no CB ever has. Well that has absolutely no bearing on who the Panthers should take at #1 this year. If they think he can help their team more than anyone else in the draft then they'll take him. 2. The Denver Broncos select Marcel Dareus, DT from Alabama. The Broncos had an awful season defensively last year. They couldn't stop anyone at anything and Dareus will go a long way to helping them fix that this year. He is going to be a good DT in any scheme they choose. Dareus is ahead of Fairley on the SKOHRboard Top 40 now becuase he is a much safer pick. He has consecutive years of incredible production despite double teams rather than Fairley's one spectacular season. Dareus is strong against the run and has tremendous quickness which he can use to get after the QB. This guy will immediately help their defense. 3. The Buffalo Bills select Von Miller, OLB from Texas A&M. The Bills top two choices are off the board and while they would love to have a stud to play DE in their 3-4 system both Bowers and Fairley seem better suited to a 4-3. However, Von Miller is no slouch and while this might be a few picks higher than I think he should go, Buffalo is makes a great pick in grabbing him here. Miller's size and speed compare favorably to the wunderkind of OLBs, Clay Matthews. Matthews production is almost definitley going raise the value of similar players as teams look to find another guy who can do what he does. Miller might not bring it as much against the run or hit quite as hard but he is faster and probably more athletic. If the Bills utilize him correctly, he could become a pass rushing nightmare for opposing teams. God knows the Buffalo fans be happy to get a few more hits on Brady and Sanchez. 4. The Cincinnati Bengals select Blaine Gabbert, QB from Missouri. Carson Palmer's imminent departure from Cincinatti is the reason they need to make this move. The Bengals had a terrible season last year given the talent on their team. Big time changes need to happen and a new leader in the clubhouse should go a long way to turnning things around down there. The problem is that Gabbert probably won't be able to step in and start right away. So they are going to need to find a stopgap veteran QB because I really can't imagine that they move forward with a rookie QB and Carson's brother Jordan Palmer as their QB options to start the season. Maybe Hasselbeck or Bulger. The other consideration here is going after AJ Green and finding a longer term QB in whatever form free agency takes this off season. McNabb? The two Ohio teams have zero top WRs between them and in this draft there are really only 2 solid WR prospects in Green and Jones. 5. 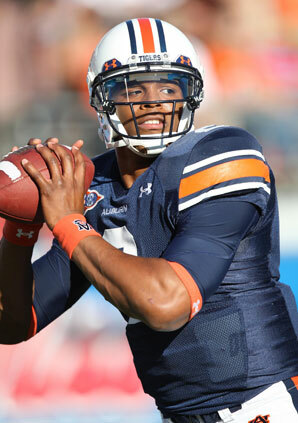 The Arizona Cardinals select Cam Newton, QB from Auburn. Newton has the biggest upside of any player in this draft. However, just like Gabbert he isn't a guy who can come in and start right away which is what you'd like to get with the #5 overall pick. The Cards definitely need a new QB though and from everything I've seen, they seem to like Newton. They spent lots of time with him according to reports and then today Head Coach Wisenhunt said in an interview that there are no QBs of Bradford's caliber in this draft. He is clearly trying to help one of those QBs drop to #5. The Cards need lots of help on offense but Newton could be an absolute Superstar in a few years and that is hard to pass up. 6. The Cleveland Browns select A.J. 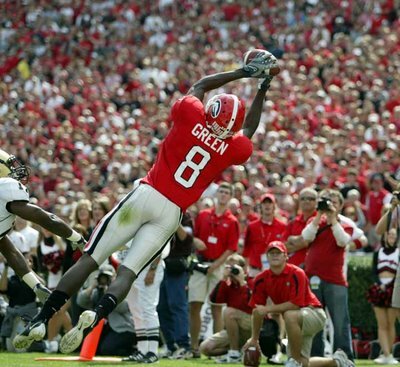 Green, WR from Georgia. This is the ideal situation for the Browns. They need a WR in the worst way and one of the best prospects to come out in the last few years falls to them here at #6. While there aren't many rookie WRs that come in and have a real impact in their first year, Green would probably get the bulk of the targets from McCoy even in year 1. 7. The San Francisco 49ers select Prince Amukamara, CB from Nebraska. Amukamara might not have the upside that Peterson does but he is probably the safer pick. He is the kind of high character guy who also has the skills at a position of need that I can see Harbaugh going after. This would be a great pick for the 49ers. 8. 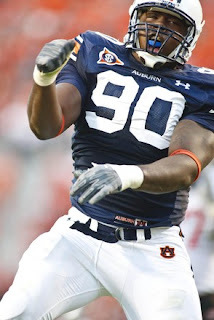 The Tennessee Titans select Nick Fairley, DT from Auburn. Fairley's stock has dipped a bit but not enough to scare away a 4-3 DT needy Titans squad. He has the ability to be a dominant DT in the NFL. Although they have had some big time coaching turnover, the Titans have a history of putting together very aggresive defensive from sevens and Fairley is easily the best penetrating DT in this year's class. 9. The Dallas Cowboys select Tyron Smith, OT from USC. Smith is probably the most athletic Tackle in the draft. He is young at only 20 years old so he's still a bit rough around the edges but that is just a matter of good coaching over time. You can't teach a 310 pound guy with 36 inch arms to run and react as quickly as he can. This would be a great move by the Cowboys who really need help along their offensive line. 10. 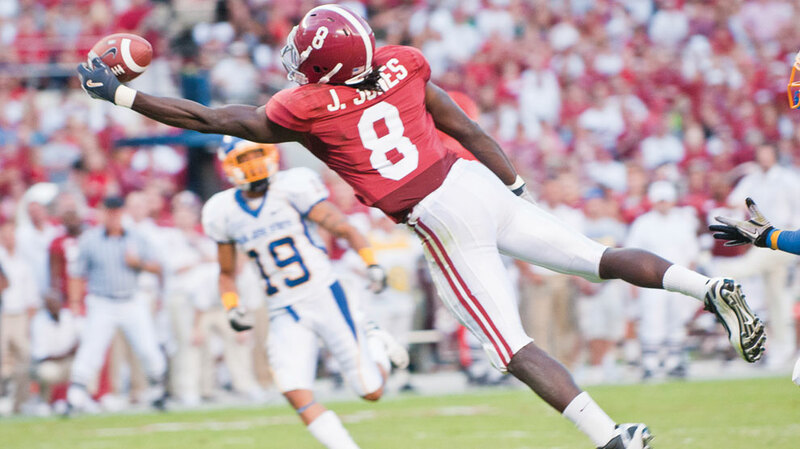 The Washington Redskins select Julio Jones, WR from Alabama. Jones is just about the best they can hope for here. The Redskins have needed WR help for years after totally missing on Devin Thomas and Malcolm Kelly in the 2nd round four years ago. Jones has all the size and speed to be a real #1 WR in the NFL but has had problems with drops and he doesn't really ever dominate games despite the huge mismatches he creates with every DB who faces him. I could also see a trade happening here. The Redskins need help along their O-line and there are a few guys Should be available later whose value is essentially equal so they can afford to drop down. Highly rated Da'Quan Bowers is still available here and there should probably be plenty of 4-3 teams interested enough in him to jump up to #10. 11. 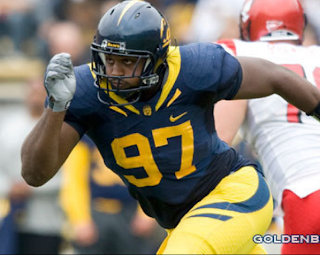 The Houston Texans select Cameron Jordan, DE from California. Jordan is a prototypical 3-4 DE. His size, athleticism, and plethora of pass rush moves makes him a great fit to play opposite Super Mario in the Texans new 3-4 alignment. 12. The Minnesota Vikings select Da'Quan Bowers, DE from Clemson. Bowers definitely wasn't supposed to fall this far but I'm not sure if a 3-4 team would take him and many of the teams selecting before this are strictly 3-4 teams. Of course any of those teams could take him and he'd probably be good, but what makes him great is his ability to pressuring the QB, not holding up lineman to let Linebackers make plays. 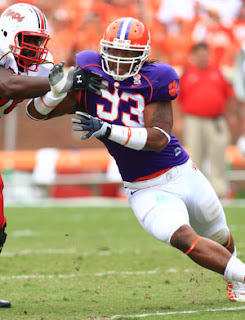 With Ray Edwards in Free Agency they would love to grab a talent like Bowers to put opposite Jared Allen. Sure they have bigger needs at QB and OT, but there are a few guys that they could nab by moving back into the later portions of the 1st round. 13. 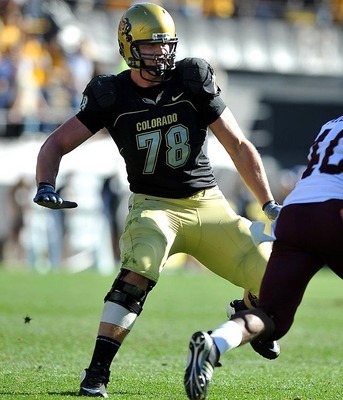 The Detroit Lions select Nate Solder, OT from Colorado. Among the 5 top OTs in this years draft Solder probably has the 2nd highest upside after Tyron Smith who rank 16th and 10th respectively on the SKOHRboard Top 40. He is still raw as he only became an OT in College after playing TE before that. However, his size and athleticism should help him keep Matt Stafford upright which is really going to be key if the Lions hope to make that final leap to the playoffs this season. 14. 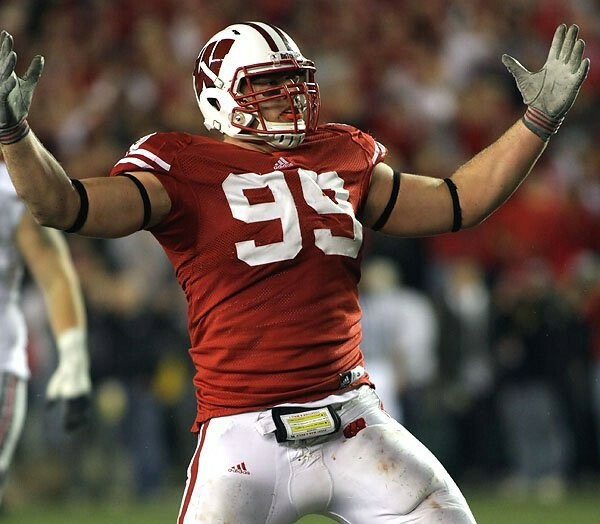 The St. Louis Rams select J.J. Watt, DE from Wisconsin. Watt's versatility makes him very attractive here. He can play all three downs by moving from DE to DT on passing downs. That will also play into Spagnuolo's attacking schemes. 15. 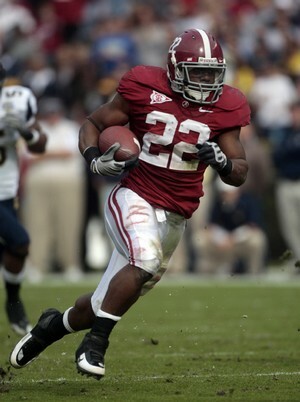 The Miami Dolphins select Mark Ingram, RB from Alabama. Ingram just makes too much sense here. He is the bruising and ultra productive kind of guy that the Dolphins would love. They are most likely losing at least one of Williams or Brown if not both and Ingram will go far to replace them. He is absolutely the single elite RB prospect in this year's draft. 16. The Jacksonville Jaguars select Robert Quinn, DE from North Carolina. Quinn is almost considered a steal here because his skill could make him a Top 10 pick but it's clear from this example that he could slide a bit. 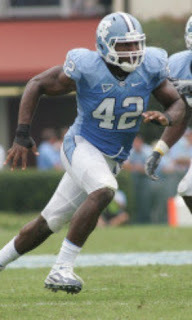 His talent is undeniable and he'd be able to play either DE or OLB in the Jaguars 4-3 system. Quinn would really help out a good young defensive line in Jacksonville and he just might finally be the guy to help them get some pressure on Peyton Manning. 17. 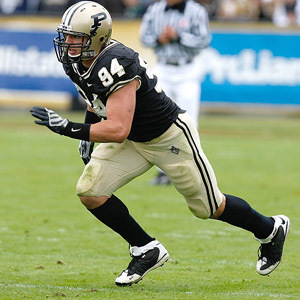 The New England Patriots select Ryan Kerrigan, DE from Purdue. If the Pats weren't going to get Watt, they had to get Kerrigan right? This guy just seems like a great fit for that team who desperately needs to find some sort of pass rush. They really struggled getting after the passer last year. Kerrigan has a knack for coming up with big plays in big games and there haven't been many teams who've played in more big games than the Pats over the last few years. 18. The San Diego Chargers select Muhammad Wilkerson, DE from Temple. Wilkerson played mostly DT at Temple but he would be a great stout yet athletic DE in the Chargers 3-4 front. He has very long arms and is surprisingly nimble for such a big guy. San Diego would do well to pick up Wilkerson at 18. 19. 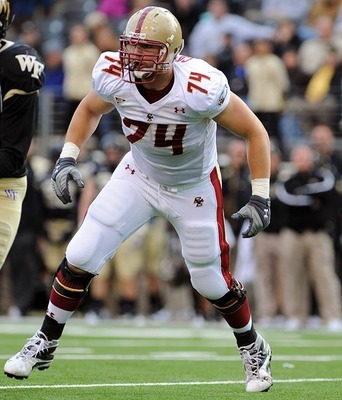 The New York Giants select Anthony Castonzo, OT from Boston College. The Giants had a lot of problems at OT last year and they were never able to give Manning the kind of time he needs in the pocket. Castonzo is a guy who can come in and play right away. 20. 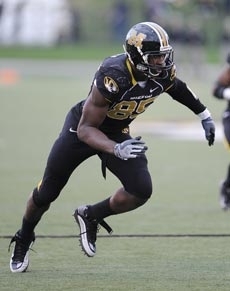 The Tampa Bay Buccaneers select Aldon Smith, DE from Missouri. Aldon Smith is another young talent who has too much upside to pass up. Smith's length and athleticism actually remind me a little of Mario Williams.' He isn't quite as strong at the point of attack, but he should bulk up as he gets older in an NFL program. He would be a great fit to go with the two DTs they chose in rounds 1 and 2 last year. 21. 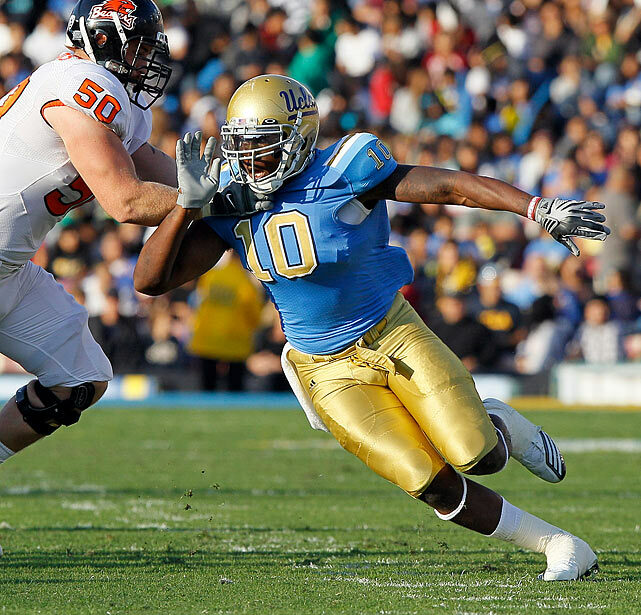 The Kansas City Chiefs select Akeem Ayers, OLB from UCLA. Ayers has gotten a bad rap recently as his workout numbers haven't quite lived up to his athletic reputation. That probably just means that his instincts are very high. Whatever the case may be he is a consistent playmaker that would be a big time asset for the Chiefs. 22. 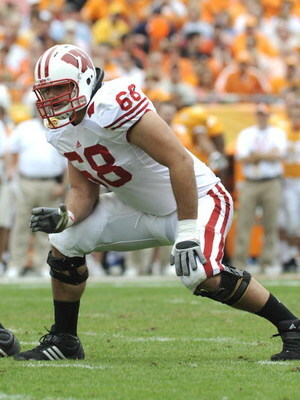 The Indianapolis Colts select Gabe Carimi, OT from Wisconsin. Carimi has been labeled a run blocking OT but he can definitely pass block just as well as any OT on the Colts roster now. They desperatly need help along the line and Carimi would provide them depth along the whole front. Keeping Peyton healthy has to be the top priority of their team every year. 23. The Philadelphia Eagles select Jake Locker, QB from Washington. It might be a stretch and it would definitely make Eagles fans go crazy but Locker would be a great apprentice to Mike Vick. His athleticism and arm strength are all there but he needs to focus on being a passer in a pro offense and he could be a great NFL QB. Who better to help him with that than the guy who has helped another athletic scrambling QB with great arm strength, Marty Mornhinweg? While it's tough to cite the Eagle's drafting Kolb during McNabb's reign as a precedent I'm going to do it. The Eagles have always been a team that plans for the future and I can see Locker being a very reliable backup to Vick for the next few years before they try to trade him and make Locker the starter. 24. The New Orleans Saints select Corey Liuget, DT from Illinois. Liuget is a workhorse DT who would provide an immediate impact along the front line of the Saint's D. He would be able to help in both run stuffing and pass rush. While the Saints could use help in a few places DT is certainly one of them and he is flying up draft boards so don't be surprised to see Liuget go even before this. 25. 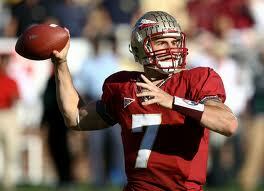 The Seattle Seahawks select Christian Ponder, QB from Florida State. I've had Mallet going here before and he still might but I think Ponder has a better chance to be succesful in the Seahawks West Coast system than Mallet does. He is very smart, athletic, and very accurate. Hasselbeck and Whitehurst are relative unknowns for next year. I can see Hasselbeck going somewhere else and the Seahawks starting the year with Whitehurst as Ponder learns the ropes. Ponder is a very bright guy so the length of the lockout would definitely have an impact on how long it would take before Ponder takes over. 26. 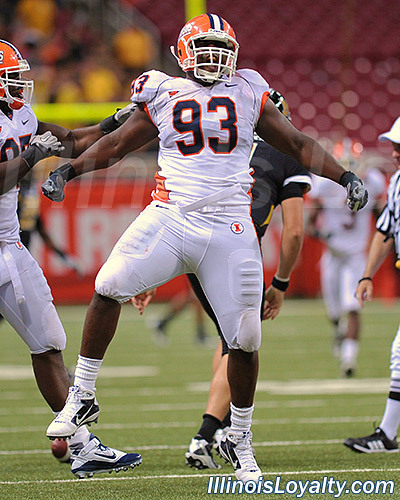 The Baltimore Ravens select Martez Wilson, LB from Illinois. 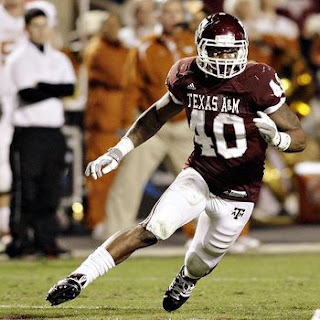 Martez Wilson is going to be the ultimate replacement to Ray Lewis. He is easily the top MLB prospect in this draft class but has the athleticism to play OLB too which is where he'll get his start in this system as he learns from Lewis. 27. The Atlanta Falcons select Justin Houston, DE from Georgia. Teams don't necessarily try to pick the kid from the local school but it just works out in this situation. Houston was a terrific pass rusher at UGA and the Falcons really need some help getting after the QB. They have been near the bottom of the league in that category for the past 2 years and Houston should begin as a situational pass rusher as he works himself into the regular lineup. 28. 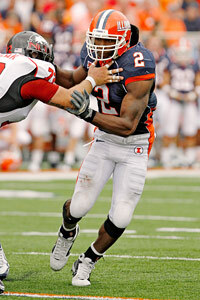 The New England Patriots select Mikel LeShoure, RB from Illinois. The Pats have needed a real RB option for several years now as their committee has just merely gotten the job done but never excelled. LeShoure would give them that top RB who could really be a game breaker. He can catch the ball very well out of the backfield, run with power, and be the lead back. This addition will give Brady another powerful weapn for that potent offense. 29. The Chicago Bears select Derek Sherrod, OT from Mississippi State. 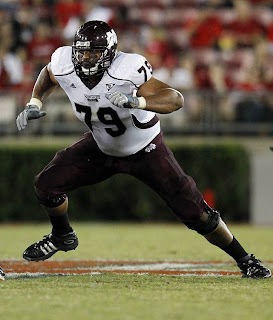 The Bears really need offensive line help this year and Sherrod will be able to step in right away. He would allow one of their overmatched Tackles to slide down into Guard. With Mike Tice working on the group last year they saw a definite improvement as the season went on but an infusion of talent like Sherrod will go even further. Cutler is a guy who needs to have time to throw especially in Martz's system so he'll be especially thankful for this pick. 30. 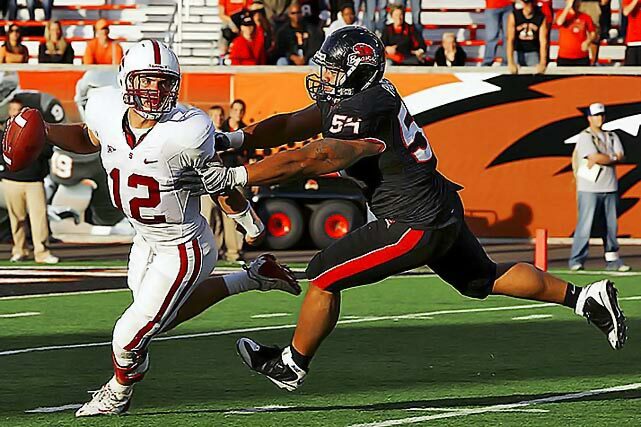 The New York Jets select Stephen Paea, DT from Oregon State. Paea was somewhat of a quiet prospect coming out of the Pac-10 despite dominating the conference for the last 2 years. His record breaking bench press performance at the combine certainly made some noise though. If there is one coach who is comfortable with big time players making some noise on the field it's Rex Ryan. This pick is also helped by one time DT stud Kris Jenkins saying that he would most likely not be returning to the Jets after 2 consecutive season ending knee injuries. 31. 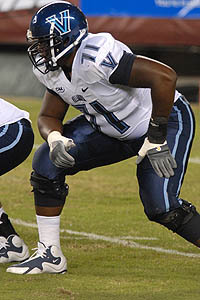 The Pittsburgh Steelers select Ben Ijalana, OT from Villanova. 32. 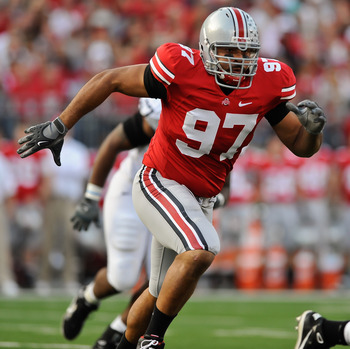 The Green Bay Packers select Cameron Heyward, DE from Ohio State. The Packers did a nice job getting after the QB last year but upgrading their DE's with a guy like Heyward would go a long way. He is a big body that can move enough to get after the QB. Heyward has also really showed up in big time games. If he is able to keep it turned on like that all the time he is going to be a steal even for a 1st round pick. 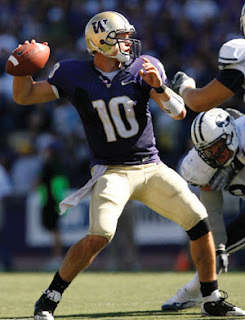 Jake Locker to the birds? Not sure I like that. I know Locker to the Eagles sounds crazy but when has that stopped Andy Reid before? This is also assuming that the Eagles trade Kolb or are counting on Kolb being traded. Locker is the perfect understudy to Vick. The Eagles don't need him to play right now and would probably bring in a veteran backup for help anyway. His arm strength and elusiveness are tremendous but he needs a few years to focus on being a QB and working with Reid and Co during those years would be huge. In this scenario the Eagles could sign Vick to a 4 year deal, one shorter than Locker's 5 year deal, and then trade Vick before his value is gone and after Locker has 2 years of tutelage. Makes a lot of sense to me. Yea you make solid points. I feel like the NFC is wide open and this team is ready to win now if they can fill a couple holes on D and on the O-line though. Tough to give up a first round pick right now. Not that it's giving it up but it's using it for the future. BUT our offensive talent is so young that if we could get a good young QB (assuming Kolb is traded) then it would set our offense for years to come. So I hear you there. Pouncey slips out of the 1st and falls to the Cardinals with the 38th overall pick. Good eye Anonymous.